Save Marinwood-Lucas Valley - our community, our future: Why is Marinwood Fire Department considering a bid for $54,000 kitchen remodel when they have a $4253 cost estimate? 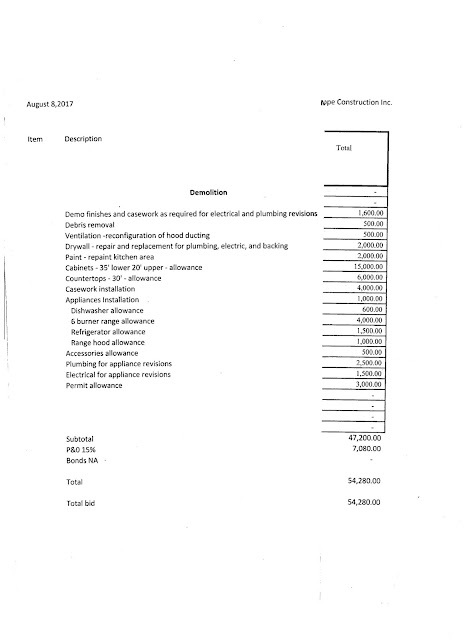 Why is Marinwood Fire Department considering a bid for $54,000 kitchen remodel when they have a $4253 cost estimate? Marinwood Fire Department seeks approval a $54,000 kitchen remodel with $4253 Ikea cabinets. Special Meeting, August 31, 2017 at 5:00 PM. The Marinwood CSD is seeking to approve a massively expensive kitchen remodel for $54,280 despite a cost estimate for $4253 cabinet cost and a generous offer from a member of the public for a $25,000 donation. The donation was rejected as well as a proposal for commercial grade restaurant cabinets for less than $15,000 that would save tens of thousands of dollars in construction costs and time. Why does the Marinwood CSD insist on paying top dollar and contract a new kitchen? The current favored bidder, John Pope Construction has two sons in the fire service and is qualified to work on government projects for more than $25,000 but this is completely unnecessary under the law for prevailing wages. It is maddening to see our tax dollars wasted like this. We could buy more park benches, play structures or apply it to our new capital improvements or retirement plans. Please consider attending this meeting 8/31/2017 at 5:00 PM and share your perspective. The provisions of this article shall apply to contracts by community services districts as provided for in the Community Services District Law pursuant to Division 3 (commencing with Section 61000) of the Government Code. (a) A district may purchase materials and supplies for the construction or completion of any building, structure, or improvements in the open market when the cost does not exceed twenty-five thousand dollars ($25,000). Prevailing Wage law states that only construction projects costing more than $25,000 are subject to Prevailing Wages. Q. What are the threshold requirements for a public works project? A. Prevailing wages must be paid to all workers employed on a public works project when the public works project is over $1,000. If an awarding body elects to initiate and enforce a labor compliance program, that has been approved by the Director of the Department of Industrial Relations, for every public works project under the authority of the awarding body, prevailing wages are not required to be paid for any public works project of $25,000 or less when the project is for construction work, or for any public works project of $15,000 or less when the project is for alteration, demolition, repair, or maintenance work. Exhibit Four: August 8, 2017 Discussion of Kitchen Plans. Bid from John Pope Construction for $54,280.00 that is the favorite among early bids receive by Chief Tom Roach yet the Marinwood CSD has not followed the public contract law for purchases over $25,000.